Prick the skins of sweet potatoes several times with a fork. 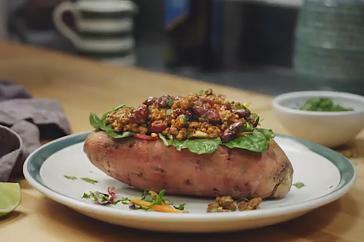 Lightly spray sweet potato with oil and place on a plate lined with paper towel. Microwave on HIGH (100% power) for 8-10 minutes or until just tender. Set aside. Meanwhile, heat oil in a large non-stick frying pan over medium-high heat. Add onion and cook for 2-3 minutes until softened. Add mince and cook for 4-5 minutes until browned. Add beans and sauce and simmer for 3-4 minutes. Season to taste. To serve, cut sweet potatoes in half lengthways. Top with mince mixture. Sprinkle with cheese and coriander. Serve with coleslaw or salad and lime wedges. Beef strips would also work well in this recipe. Use your hands when adding the mince to the pan – it will help separate the mince. Leftover chilli con carne can be used to make sloppy joes – fill soft burger buns with warmed mince and salad.